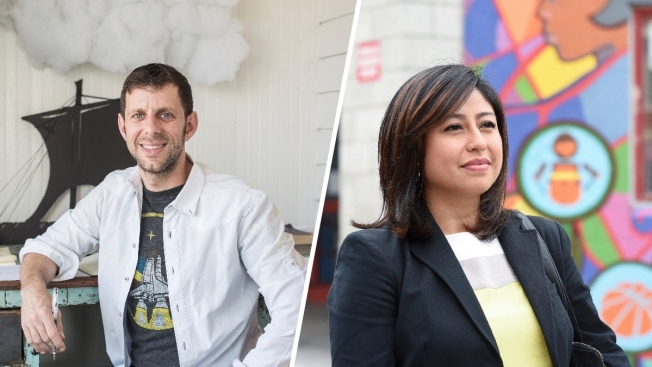 These photos provided by the John D. and Catherine T. MacArthur Foundation show "genius grant" winners Yuval Sharon (left) and Cristina Jimenez Moreta. A director who has taken opera from the concert hall to the streets of Los Angeles and an organizer who helped put a human face on the plight of young undocumented immigrants are among this year's MacArthur fellows and recipients of the so-called "genius" grants. The Chicago-based John D. and Catherine T. MacArthur Foundation on Wednesday announced the 24 fellows, who each receive $625,000 over five years to spend any way they choose. The recipients work in a variety of fields, from computer science to theater, immunology and photography. The foundation has awarded the fellowships annually since 1981 to people who show "exceptional creativity in their work and the prospect for still more in the future." Previous winners have included "Hamilton" playwright Lin-Manuel Miranda, and author-journalist Ta-Nehisi Coates. There is no application process. Instead, an anonymous pool of nominators brings potential fellows to the foundation's attention. Those selected learn they've been chosen shortly before the awards are announced. For opera director and producer Yuval Sharon the news that he had been selected was "an enormous shock and honor." When the foundation called, he assumed they were seeking a referral for someone else who'd been nominated. "I'm totally amazed," said Sharon, 37, the founder and artistic director of The Industry, a Los Angeles-based production company that produces operas in nontraditional spaces and formats. A 2015 production transported audience members and performers to various locations in Los Angeles via limousines, with singers and musicians performing along the way and at each stop. His next work, an adaptation of the radio program "War of the Worlds" will utilize decommissioned World War II sirens to broadcast the performance occurring inside the theater onto the streets. The sounds of performers stationed outdoors — and likely the traffic and other street noise — will then be transmitted back into the concert hall. Sharon said he comes across many people who don't think opera is for them, but he hopes hearing about these kinds of "audacious experiments" will peak their interest. Another fellow, Cristina Jiménez Moreta, is co-founder and executive director of United We Dream, a national network of groups led by immigrant youth. Moreta, 33, and her parents came to the U.S. illegally from Ecuador when she was a child. At 19, she revealed her undocumented status publicly. It was a move that put her and her family at risk of deportation, but also placed her at the forefront of a movement to change the way immigrants are perceived. She was instrumental in pressing for the 2012 adoption of Deferred Action for Childhood Arrivals, the now-endangered executive order that allowed thousands of undocumented young people to live without fear of deportation. Moreta said the fellowship is recognition of the resilience shown by her parents and other immigrants who "had the courage to stand up and say 'we are here, this is our home and we are fighting.'" The first people she told were her parents, who were fearful when she started organizing but now join her in marches and to pass petitions. Also selected was Deyoud Bey, a photographer and educator from Chicago whose portraits often feature people from marginalized communities. For "The Birmingham Project," he commemorated the 1963 bombing at a church in Birmingham, Alabama, that killed six children, with a series of portraits of Birmingham residents who were the age of each of the children killed and the age they would be if they had lived. Others announced Wednesday were writer and cultural critic Viet Thanh Nguyen — whose novel, "The Sympathizer," about a communist double agent, won the 2016 Pulitzer Prize for fiction — and Derek Peterson, a historian of East Africa and professor at the University of Michigan.